MADE IN THE USA - 15 total clear, round, plastic plant saucers - 5 small, each is 6" at the top and 4-7/8" at the bottom; 5 medium, each is 8" at the top and 6-7/8" at the bottom; 5 large, each is 10" at the top and 8-1/2" at the bottom. SUPERIOR PROTECTION - Never worry about excess water or spilled soil staining or damaging your household surfaces again! These drip trays will catch excess debris and moisture with their waterproof design. OPTIMAL PLANT DRAINAGE - Ensure your favorite houseplants, pots, planters, and flowers have an ideal drain tray while not having to worry about over or under watering them. 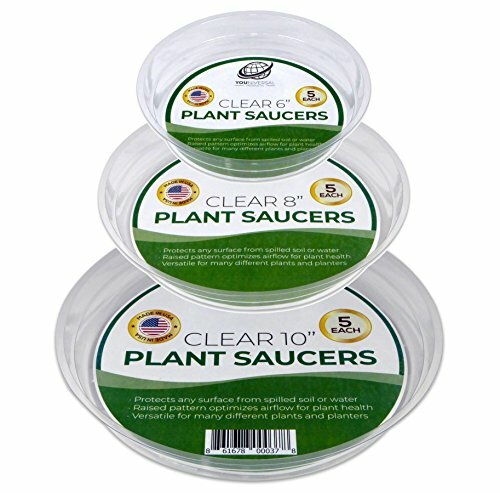 EXCELLENT FOR DIY - These saucers are great for gardening projects and home décor. You can decorate around the base of your favorite potted plants and flowers while protecting your surfaces against moisture, mold, and mildew. SATISFACTION GUARANTEE - Take advantage of these benefits for multiple home garden locations around your house with this 5-pack of saucers! They are backed by a 90 day manufacturer warranty. If you have any questions about this product by YOUniversal Products, contact us by completing and submitting the form below. If you are looking for a specif part number, please include it with your message.